You may find it hard to believe. Just 4-5 years ago (Date of writing: Feb 2014), it was actually possible to own a decent-sized and decent quality condominium unit in urban centers like KL / Petaling Jaya / Johor Baru / Penang for RM200,000. They were in fact, quite common. From 2010 up till 2012, the government had considered the price bracket of RM220,000 to be within the “affordable” housing range. This was evident when they first launched the My First Home / Skim Rumah Pertamaku (SRP) for houses up to RM220,000. However, towards the tail end of 2012, it was becoming increasingly evident that houses for that price were becoming more of a rarity. Genuine first time house buyers were gradually finding themselves priced out of the market. Recognizing the changing property price landscape, the government in 2013 bumped the maximum price range for qualifying for SRP up to RM400,000. The move garnered ridicule from both sides of the spectrum for different reasons. On one end, lower income groups found it laughable that a price tag of RM400,000 for a house could even be considered “affordable” as it was far beyond their reach. On the other hand, the younger and more urbane groups who were striving towards their first home derided the ceiling price of RM400,000 as being out of touch. Their contention was that prices for an acceptable standard of housing was already priced beyond RM400,000. If anything, the government’s efforts at trying to determine what is “affordable” shows us that it should be assessed to our personal situation. And what might be affordable to you today may no longer provide as comparable a standard of living compared to what was affordable to you 5 years ago. Regardless of what is affordable to you, how much is really needed to purchase an “Affordable” house? We examine house prices ranging from RM100,000 to RM600,000. 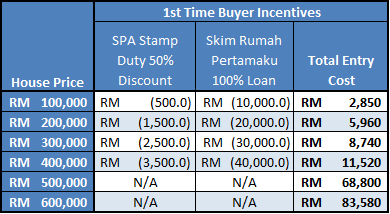 Even if one does not qualify for the above schemes, there is still KWSP’s scheme that allows you to withdraw money from your EPF Account II to help pay for the down payment of the house. Even if one can afford the initial cash outlay to purchase the house, one must still be able to qualify for a mortgage loan to proceed with the purchase. When assessing whether a housing loan is affordable, there are 2 criteria that must be considered. Firstly, do you meet the minimum acceptable level of income you must have before a bank would even give you a housing loan. Secondly, even if you do qualify for the home loan, after paying off your monthly installments, realistically, could you get by on the remaining amount? It would be unwise to enter into a home purchase if your answer to either of the above is “No”. The table above indicates the estimated minimum level of household income one must have to qualify for a loan of the given amount in the year 2014. It also shows clearly the estimated monthly installments one must pay. These calculations have not even taken into consideration any other commitments that you may have! While your personal financial situation may be unique, the costs associated with the purchase of a home are somewhat set according to price. The best way to know what you can afford is to measure your personal finances against the required costs. Finally, whether or not you are a first time home purchaser, remember to take advantage of Loanstreet’s home loan comparison tool and expertise to help you through your purchase and home loan application.